While visiting the famous Croatian karst jewel, which is Cave Biserujka, do not forget to also see its beautiful surroundings. Biserujka Cave is the only Karst cave on the island which is receiving visitors, so Tomaž and I decided to pay her a visit. We went towards the village of Rudine, where we followed quite well marked path that had signposts, which lead us to the free parking lot, where we parked the car and continued the next 100 meters on foot, towards the cave Biserujka.
. After about 20 minutes the employ guide took us into this smaller, 110 meters long cave. 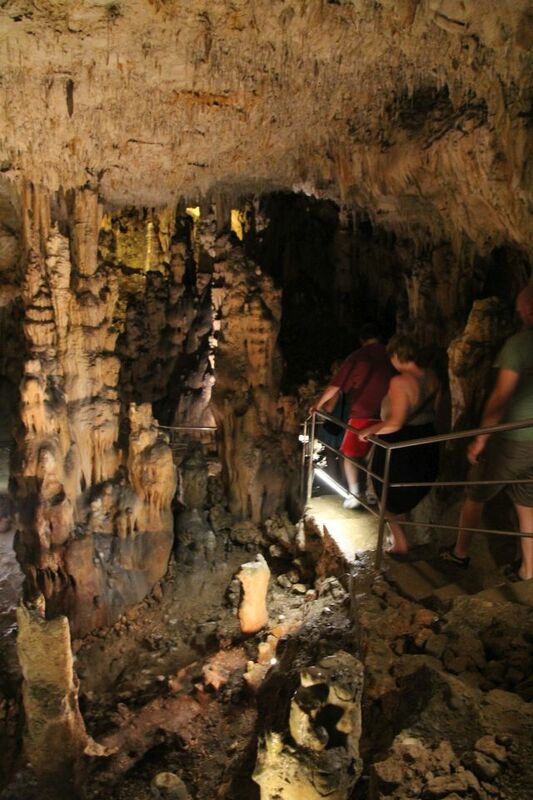 Despite its size, the Biserujka cave proudly brags with a full collection of beautiful stalactites, stalagmites and calcite columns, that will not leave you indifferent. During the summer months the cave in addition to all its beauty, can also be a great way to cool off, since its temperature is around 14 degrees. A guide presented the cave in Croatian, Italian and German language. The tour lasted about 15 minutes. We learned that the cave was discovered about a hundred years ago. Legend has it that years ago this cave was a place where pirates hid their gold. From here derives its name. The cave is very nicely lightened, so we could do some wonderful pictures without using the flash. Flash photography is not permitted because of reason that the cave ecosystem is very fragile, and the flash gun could demolished its balance. We also learned that the most famous inhabitant of the cave is endemic shrimp or as they call it (Krčka špiljska babura), which only residence in the world is cave Biserujka. After a brief tour of the cave, Tomaž and I decided, to as well explore the surrounding area. 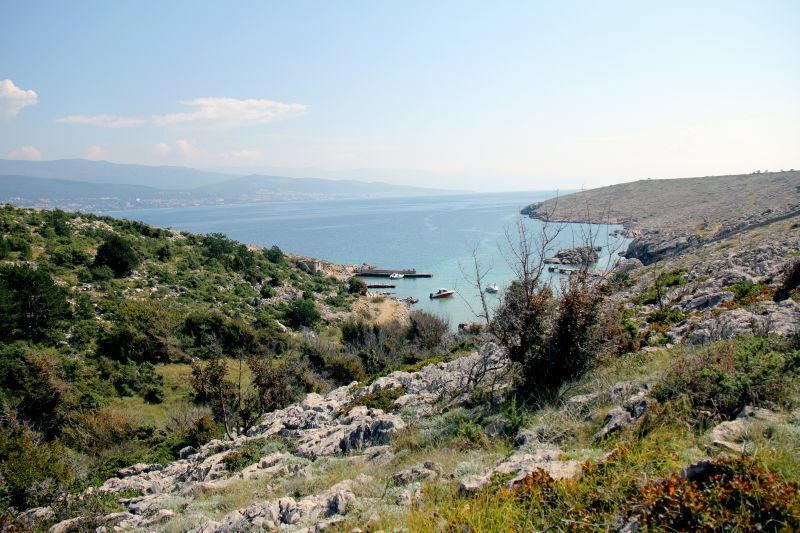 Only a few minutes away we can walk along the well-marked path to Slivanjska bay, for which they sat it has one of the most beautiful beaches. But you can decide that for yourself. They got the idea that in the place, where now we see the stone remains, they would build a “white hotel” but unfortunately that was just an idea. In my opinion, those ruins are the ones who brings the bay a special charm. When we were returning from the Gulf to the parking lot, we also met a number of animal friends who were curiously looking around. 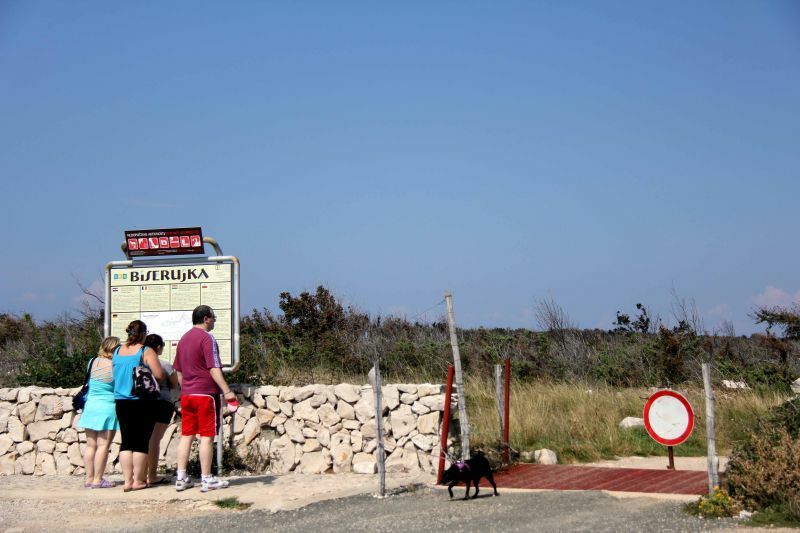 If you are planning to go and explore the island of Krk yourself, don’t forget to take your time and visit Rudine – it’s Biserujka cave and ther beautiful surroundings. – You won’t regret it.